This campaign ended on April 16, 2018, but you can still make a gift to Wellesley College by clicking here! Trustees Lynn Johnston ’64 and Mary White ’79 gave $50,000 because 2,620 donors made a gift in 1 day. The Challengers gave $262,000 because 2,620 donors made a gift in 20 days. Help Wellesley reach the finish line by becoming an advocate! When you generate one donation, you can show off your Wellesley pride wherever you go: choose from a pair of Wellesley shoelaces or an adhesive Wellesley cell phone pocket. Wellesley sticks with you, no matter what: When you generate five donations, receive a Wellesley window decal! Up for the challenge? Generate 10 donations and you can take Wellesley with you on your next adventure with a Wellesley license plate frame, or relax at home with a cozy sweatshirt blanket. This April, Wellesley alumnae are being challenged to spend the six days leading up to Marathon Monday giving back. Together we’ll make a big difference in a short period of time—and celebrate the generosity of our Wellesley community. Because during the Marathon Monday Challenge, every gift makes an even bigger impact. Ready for the details? Fifteen Wellesley women who believe in the power of participation will collectively give $262,000 to keep Wellesley running if 2,620 alumnae make a gift to the College between April 11 and Marathon Monday, April 16. Can we count you in? This challenge is all about participation; giving back to what made your Wellesley experience so great, supporting future students, and building community. It’s a can’t-miss opportunity to make your gift go even further. Join the race to 2,620 today! Questions? View our challenge FAQ. 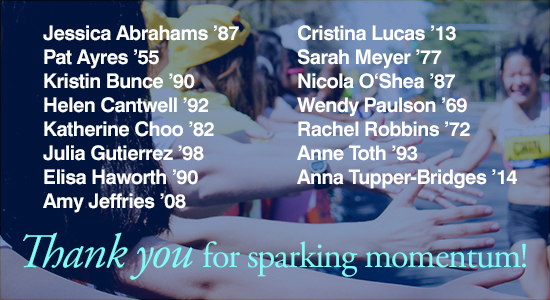 To make the Marathon Monday Challenge possible, the following alumnae offered their generous and increased commitments to The Wellesley Fund. With their generosity, we have the power to inspire others and fuel transformational educational experiences at Wellesley!